The Western Balkans (Albania, Bosnia and Herzegovina, Kosovo, Macedonia, Montenegro and Serbia) is a region that has experienced significant economic development in the past decade. Economic development is fuelled by increased electricity demand. Several countries in this region have been short on electricity production and experienced difficulties in satisfying their domestic demand. 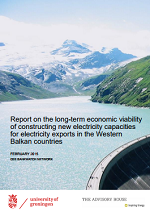 Almost all governments in the Western Balkans have plans to extend their electricity generation capacity to meet their demand, but they also demonstrate the ambition to become electricity exporters. When countries expand their electricity generation capacity at the same time with a view to provide electricity to the region, this creates the clear and present danger of excess supply and stranded assets. Stranded assets are commonly conceptualized as assets that become uneconomic to operate. In the context of the energy industry Caldecott and McDaniels define stranded assets as plants that became uneconomic to operate, since “their marginal cost of generation exceeds the price for electricity”.